FOCUS: O ~ Optimize Your Plan or your Path to Success! Over the last few weeks I’ve had several favorable comments on the FOCUS approach to a marketing program. There are many ways to market and this approach is just one way to plan, organize, develop and implement marketing programs. 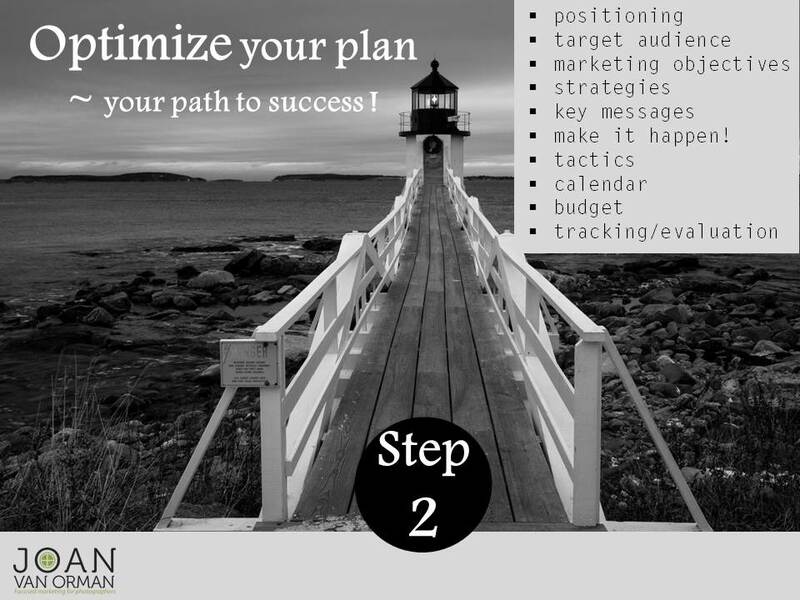 I’m excited to be presenting these 5 steps to an actionable marketing plan to a group in Asheville in June. More about that to come! ~ Positioning and target audience (from Step #1), marketing objectives and marketing strategies, key messages, Make it Happen! tactics, calendar, budget and tracking/evaluation. Define and describe the primary and secondary target audiences in terms of age, income, motivations, geographic areas – really working to define customers and potential customers as specifically as possible. Later you’ll match the media outlets and other public relations opportunities to the target interest. What do you want for the end result/accomplishment of your marketing program? customer trial, sales increase, orders, volume, new distribution points, new geographic areas? These are examples – your marketing objectives will be unique to your business. This section follows the positioning statement and states the primary and secondary messages that will be communicated to the selected target audience. All marketing vehicles should work cohesively to reinforce positioning and messaging. Develop a budget for marketing programs. Some tactics may not have a direct cost (example – sending in a press release) however there is a cost in time allotment for developing materials. Also if you hire marketing and public relations assistance there will be a cost. I work with clients to teach them how to do their own marketing. That said, of course I’m also an advocate of hiring professional marketing help! Common elements to budget for: brand identity elements: logo, business cards, business stationary, rack/promotional card/brochure; advertising costs, materials costs: folders for press information, promotional items, website development/maintenance/hosting; marketing events. These are examples only and will be unique for each business. Once the tactics are determined, a promotional calendar is used for scheduling, for planning and for tracking results. Whatever format works best. A simple document or a more comprehensive flowchart. I like to include all the marketing elements on one spreadsheet – it provides a great overview of all the marketing vehicles that are working for your business. Refer to your marketing objectives and make sure you are measuring results on the objectives – example – sales units/revenue, customer trials, etc. Each communications vehicle can be tracked to determine what is contributing to success or what needs to be tweaked. For example, if you ran a print ad – what was the response to the call to action? Did a press release run locally or regionally? What was the response to the call to action? Consider the metrics you will use for each all of the elements of your marketing. These elements ideally will all work together to meet business objectives. There are qualitative measures also to take into consideration as you evaluate individual components and the full “marketing mix”. Remember to have fun with your marketing plan and continue to learn and develop new ideas. I like to fill marketing plans with images and graphics that resonate with the customer, instruct and are easy to follow.